Where do these lovely dahlias come from? We’re often asked where Lynch Creek Farm is located. 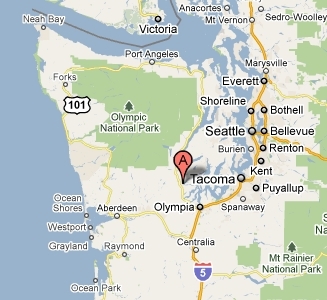 We are located in the Great Northwest! Shelton is a small town (population about 9,500) located at the elbow of the southwesternmost arm of Puget Sound, that network of waterways that extends south through Western Washington State. We are about 20 miles northwest of Olympia, Washington’s capital city. Shelton’s early industries included timber harvest and milling, agriculture, and fishing. A mild maritime climate and significant rainfall (the annual average is about 65 inches near Shelton) make it marginal for some crops, but ideal for growing trees and for growing dahlias, whose blooming season coincides with our months of least rainfall. Our dahlias grow in fields below Andy and Tracy Hunter’s home on a slope above Oyster Bay. The original “farm” in our name refers to the home of Andy’s parents, Len and Colleen Hunter, on nearby Lynch Road above Little Skookum Inlet. The hub of our processing and mailing operations is at the Port of Shelton’s Sanderson Field Business Park. The local airport dates back to World War II, when a naval air station was located there. The Lynch Creek gang moved into quarters at Sanderson Field just last fall, but we might claim a much longer connection to the airfield. Andy’s grandfather, Colleen’s dad, Jim Shrum, was stationed there during the war, and that’s how he met Andy’s grandma, Jean Charlson. And the rest, they say, is history. 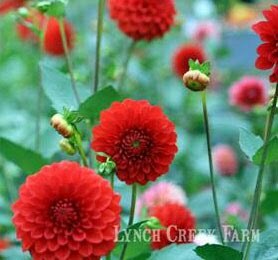 Speaking of history, watch this blog site for the history of Lynch Creek Farm Dahlias and Lynch Creek Farm Wreaths and Evergreens.